Worldwide scientists have joined forces in the search for gravitational waves. Einstein predicted these ripples in spacetime but they have never been observed directly. In 2015 and 2016 the researchers will start to work with even more high-tech equipment. From Virgo to Advanced Virgo. The three biggest instruments of a worldwide network for detecting gravitational waves are located in Italy and the United States. 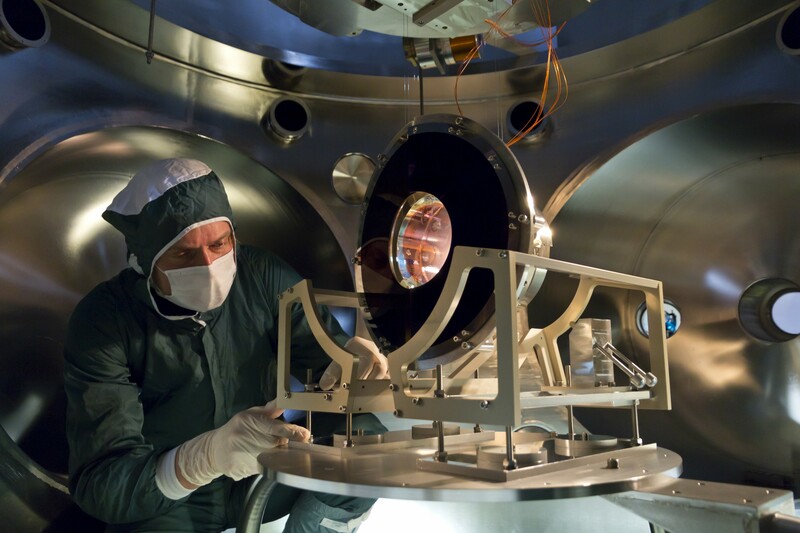 Dutch researchers are contributing to the Italian detector named Virgo. The detector has been operational since 2010. Over the past few years the researchers have not detected any gravitational waves. The research has, however, yielded several interesting (astro)physical insights. Furthermore, the scientists have demonstrated that they can make sensitive detectors. And thanks to these initial years on the project an international network of gravitational wave researchers has been established. This combination of factors has ensured that funds have become available for an upgrade of Virgo. Over the next few years Virgo will be expanded to Advanced Virgo. Many of the components for the upgrade are being constructed at Nikhef. Nikhef researcher Jo van den Brand is the project leader of the Dutch contribution within Virgo and Advanced Virgo. He explains: "We have developed vibration-isolation and cryogenic systems and we are also providing the phase cameras. We will use the cameras to search for thermal aberrations. With that information we can control the CO2 lasers and ring heaters that will subsequently apply heat patterns to the mirrors. This approach allows us to make dynamic corrections. It is a new type of adaptive optics for interferometers." Everything has to be installed by the start of 2015. After that Advanced Virgo will gradually become operational. In November 2015 the instrument will be ready for the first science run. In 2016 the instrument will once again work together with the American detectors. And then it is a matter of waiting for signals. Predictions about just how soon the first gravitational waves will be found differ. Optimistic models assume that this will be in 2016. Pessimistic estimations indicate that it might not be until after 2020. We will see. Marco Kraan from Nikhef installs the final mirror of the input-mode cleaner of Advanced Virgo. This stabilises the frequency.